Obituary – Roberts, Agnes Florine (Marshall) « Perry High School Alumni Association, Inc.
﻿Mrs. Worth (Agnes) Roberts, 78, 633 Jackson street, died at 12:45 p.m. Sunday at Perry Nursing home where she had been a resident since Jan. 8. Funeral will be at 10 a.m. Wednesday at the First Christian church. Name of the officiating minister had not been announced by late Monday morning. Burial will be at Grace Hill cemetery under direction of Parker Funeral home. Memorials may be made to the Oklahoma Medical Research Foundation for leukemia research. Mrs. Roberts was born May 22, 1901, at Avoca, Wis., the daughter of Edward F. and Francisca Marshall. She came to the Perry area in 1902. She was a 1919 graduate of Perry high school and attended Central State university. 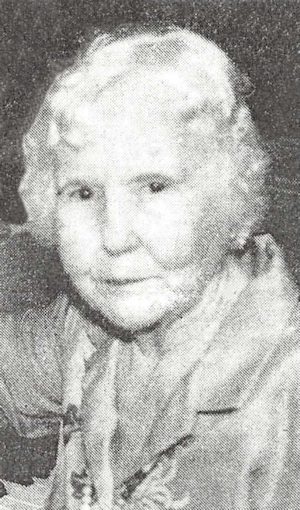 Mrs. Roberts was a private music instructor until her retirement in 1972. She and Worth Roberts were married Sept. 16, 1923, at Gentry, Ark. She was a member of the First Christian church, the Rebekah lodge and the American Legion auxiliary. In addition to her husband, Worth, survivors include two daughters, Mrs. Otto (Vayne) Cowell, Kingfisher; and Mrs. James (Sharyn) Lambert, Okarche; three brothers, A. C. Marshall and M. A. (Bud) Marshall, both of Perry; and Otto T. Marshall, New Branfels, Texas; two sisters, Mrs. Paul (Gertrude) Davis, Oklahoma City; and Mrs. C. R. (Marcella) Johnson, Perry; two granddaughters, Bonnye Mueggenborg, Okarche; and Kara L. Cowell, Kingfisher; and three grandsons, Worth Lambert, Okarche; Dr. C. Scott Cowell, Oklahoma City; and Dr. Rick L. Cowell, Fayetteville, N.C.